Watch the replay of the January 23rd webinar. Robert Schnase, Bishop of the Rio Texas shares about the Commission on a Way Forward at The United Methodist Church of the Resurrection's Leadership Institute. Commission on A Way Forward lay members: Mazvita Machinga, from Zimbabwe, David Field, from Switzerland and Myungrae Kim Lee, from the New York Annual Conference share their thoughts about the work of the Commission. This overview of the Purpose, Principles and Importance of the work of the Commission on a Way Forward was presented during the May, 2018 Commission meeting by Dr. Gil Rendle. Here are questions to consider as you watch the video: What is the new way in which I should approach my leadership in shaping the future mission of the church? Donna Pritchard (clergy, Oregon-Idaho Conference), Tom Salsgiver (clergy, Susquehanna Conference) and Leah Taylor (laity, Texas Conference) are all Commission on A Way Forward members. They share reflections on their work, the value of connection and the relationships they formed during their time together on the Commission. Jasmine Smothers, Julie Hager Love and Tom Berlin are all Commission on A Way Forward members and also clergy serving in the SEJ. In this interview they reflect on their experience and their hopes for the future of the United Methodist Church. Patricia Miller, Executive Director of the Confessing Movement and Matt Berryman, former Executive Director of Reconciling Ministries talk about their friendship and their experiences serving together on the Commission on A Way Forward. Gil Rendle, consultant to the Commission on a Way Forward, shares a modern day parable that helps us understand the difference between positions and interests. Gil invites us to consider two questions: How can I become more aware of my own interests so that I am not confined from seeing more by my own position? Bishop Grant Hagiya, a member of the Commission on A Way Forward, shares reflections about the book: Anatomy of Peace, and what it means to live with a heart at peace. Dave Nuckols (laity, Minnesota) and Helen Cunanan (clergy, Philippines) - have a conversation about the Commission on A Way Forward sharing their experiences from very different places in the world. Bishops Palmer and Schnase share reflections about the work of the Commission on a Way Forward and their hopes for the future of the United Methodist Church. Bishop Karen Oliveto (right) shares bread with Rio Texas Clergy Delegate, Paul Escamilla during a February 23, 2019, worship service in the Special Session of the General Conference of The United Methodist Church. Photo by Paul Jeffrey for United Methodist News Service. Bishop Ruben Saenz prays with Luka Bitrus, delagate from Southern Nigeria, during the 2019 Special Session of the United Methodist General Conference in St. Louis. Photo by Kathleen Barry, UMNS. Delegates pray together during the February 23, 2019, opening session of the Special Session of the General Conference of The United Methodist Church. Photo by Paul Jeffrey for United Methodist News Service. Workers prepare the Dome at America's Center for the 2019 United Methodist General Conference in St. Louis. Photo by Mike DuBose, UMNS. Bishop Kenneth H. Carter gives the sermon during opening worship for the 2019 United Methodist General Conference in St. Louis. Photo by Mike DuBose, UMNS. 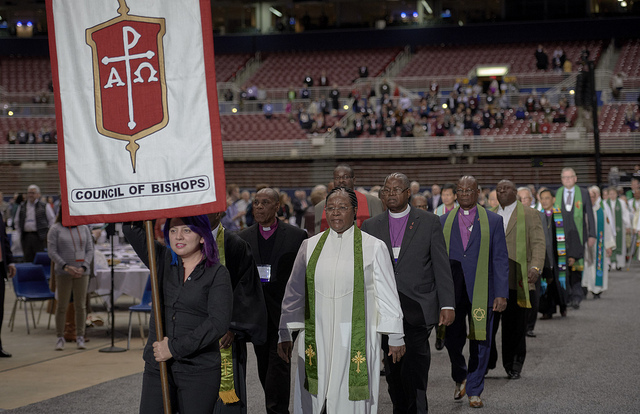 Bishops process into worship on February 24, 2019, at the Special Session of the General Conference of The United Methodist Church. Photo by Paul Jeffrey for United Methodist News Service. United Methodist bishops process into the opening worship service for the 2019 United Methodist General Conference in St. Louis. Photo by Mike DuBose, UMNS. 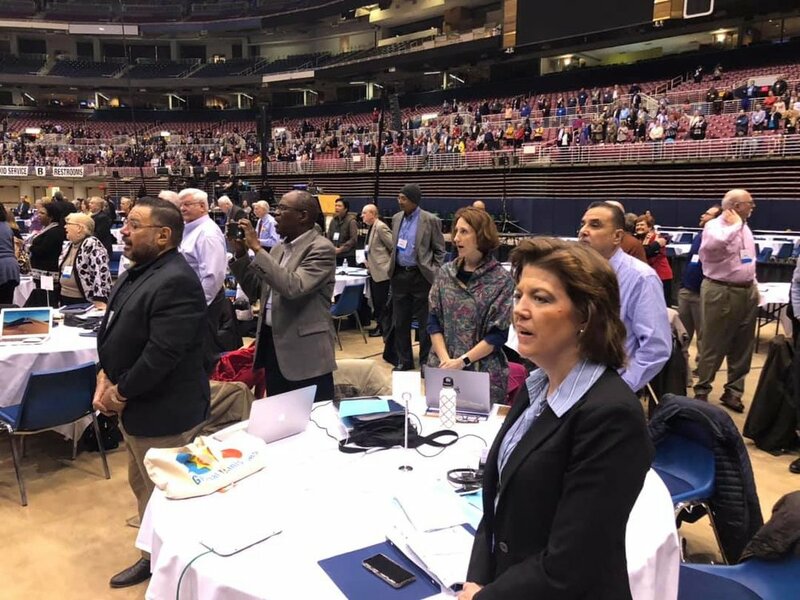 Bishops confer over the issue of whether the legislative committee can refer items to the denomination's Judicial Council for review during the 2019 United Methodist General Conference. Clockwise from lower left are: Thomas Bickerton, John Shcol, David Bard, Julius Trimble and Cynthia Harvey. Photo by Mike DuBose, UMNS. Delegate Laura Merrill from the Rio Texas Conference speaks during a debate of church policies on sexuality on February 25, 2019, at the Special Session of the General Conference of The United Methodist Church, held in St. Louis, Missouri. Photo by Paul Jeffrey, UMNS. Hover over image for description. Wespath is prepared to serve the Church in whatever form it takes in the future under any scenario. These FAQs provide additional information concerning pensions.